The most compact wet panel carrier so far in the market. 1. 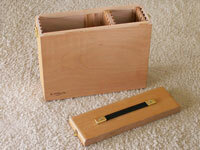 Adjustable space for carrying different panels and/or Gator boards sizes from 4"x6" up to 10"x12". Max. 40 pcs - 4"x6" (back-to-back Gator boards or 1/8" panels). Max. 20 pcs - 6"x8" (back-to-back Gator boards or 1/8" panels). Max. 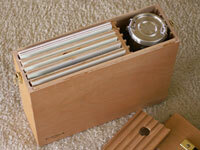 10 pcs - 8"x10", 9"x12", 10"x12" (back-to-back Gator boards or 1/8" panels). 2. Outer dimensions: 13" x 11" x 4"
The photo on the left shows both sizes 9"x12" and 10"x 12" panels total 10 pcs. are stored. You can have choice of Gator boards and/or 1/8" panels. For 1/4" panels, the capacity will be 5 pcs. 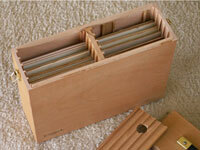 The photo on the left shows 10 pcs of 8"x10" 1/8" panels and/or Gator boards are stored. (back-to-back). A brush washer is also stored in the empty space if desired. 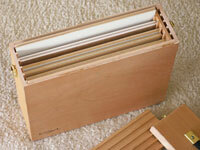 The photo on the left shows total of 20 pcs of 6"x8"- 1/8" panels and/or Gator boards are stored. (back-to-back). For 1/4" panels, the capacity will be 10 pcs.